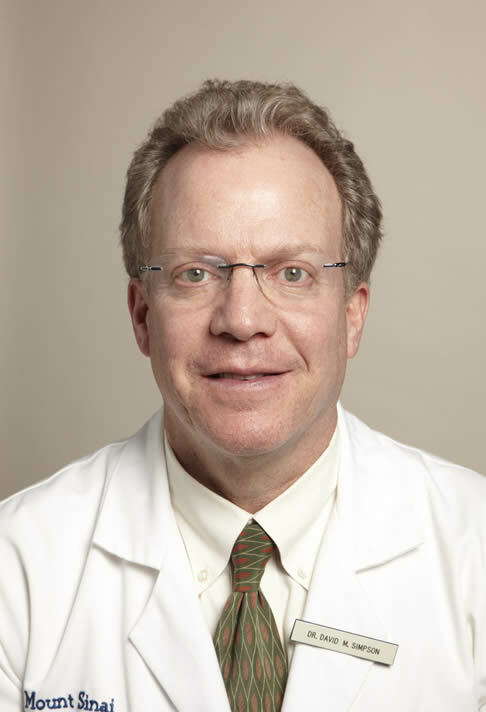 David M. Simpson, MD, is Professor of Neurology at Mount Sinai School of Medicine in New York, New York. He is also Director of the Clinical Neurophysiology Laboratories and Director of the Neuro-AIDS Program at Mount Sinai Medical Center. Dr. Simpson received his medical degree from State University of New York (SUNY) at Buffalo School of Medicine. He completed an internship in Internal Medicine at University Hospitals of Cleveland, Case Western Reserve University in Cleveland, Ohio, and a residency in Neurology at Cornell University Medical Center in New York. He completed a fellowship in Clinical Neurophysiology at Massachusetts General Hospital, Harvard Medical School, in Boston, Massachusetts. An author of 234 original publications and book chapters, Dr. Simpson is the principal investigator for many studies, including the treatment of neuropathic pain in patients with painful neuropathy and treatment of spasticity with botulinum toxin. Dr. Simpson led research studies demonstrating the safety and effectiveness of the high concentration capsaicin patch in the treatment of of painful peripheral neuropathy. Dr. Simpson is a member of the American Neurological Association and the American Pain Society and is a Fellow of the American Academy of Neurology, the American Academy of Neuromuscular and Electrodiagnostic Medicine, and the Royal College of Physicians. He is on the editorial board of AIDS Patient Care and Current HIV/AIDS Reports.